In the underbelly of the Danoshorvas continent, between the Horn of Gersaan to the East and Ieshali to the West lie many tracts of rustic and rugged lands primeval and wild. These lands are called simply the Vold by the humans that inhabit this expanse, who call themselves the Machtig-baelvolkerung (MOCK-TEEG bael-VOLK-er-UNG), which means simply the Mighty People in their own tongue. Outsiders know them as the Machtig (MOCK-TEEG), and often fear them for their barbaric and warlike ways. Transplants from the destroyed continent of Runorshorvas, this warlike people landed on the Danoshorvas continent about two thousand years ago and took over the subcontinent that they now call The Vold. A large pale skinned people with a warrior caste system, they directly and indirectly caused the collapse of all the great empires of the Age of Expansion. One of the more powerful nations now in existance, they are fairly barbarous and isiolationist. At the end of the Age of Rebirth in the northwestern region of Runorshorvas a loose union of nature-worshipping tribesmen calling themselves the Machtig-Baelvolkerung gave birth to a powerful tradition of Druidic Magic. Towards the middle of the Age of Expansion, the Machtig-Baelvolkerung grew strong and their numbers grew many. Initially they spread east and southward from their homeland but eventually stopped expanding after about three centuries at the urging of their Druids, who counseled balance. The Druids foretold that a time of settling was called for to assimilate what had been taken and incorporate the new peoples they had conquered into a Macthig culture enriched by their addition, and so it was done. For two millennia the Machtig-Baelvolkerung matured into a complex and prosperous nation, with only occasional expansion, and the many conquered peoples became as one. The end of the Age of Expansion can be traced to the exact point in time that the encroaching forces of the ever-expanding Morgathi Imperium, a dark realm ruled by Necromancers and their Undying hordes, first encountered the lands of the Machtig-Baelvolkerung. The two antithical nations squared off to a furious struggle that left the lands of the Machtig despoiled by the necromantic forces of Morgathi. The Machtig inflicted terrible casualties and wreaked massive harm upon the Morgathi, but the Legions of the Undying were said to be uncountable, with the accumulated numbers of many centuries worth of dead warriors from conquered nations. And every Macthig that fell in battle became a possible recruit for the enemies forces. Realizing they could not defeat the Morgathi via normal means, the Druids counceled the Machtig to take to the Ocean with as much as they could float and flee their homelands. This was done, with only a brave reargaurd of a few thousand warriors and a circle of the most powerful Duids remaining behind to buy the fleeing Machtig time. After the boats were well off, the Druid circle performed a terrible ritual, calling on the natural forces of the world itself to smite the Morgathi, whose dark malevolence would eventually swallow the world into Undeath if left unchecked. As in the Age of Opposition, once again the planet writhed, but this time in a deliberate attempt to rid itself of a black cancer that consumed all it touched. The entire eastern continent of Runorshorvas was tilled by great quakes and finally sucked down unto the core of the planet, causing the Oceans to swell and rise in what would come to be called the Cataclysm. The Morgathi were destroyed, the Necromancer elite and their living subjects wiped out save for a few in mountainous regions which were not wholy submerged or which happened to be away from their homeland. With the descruction of the Necromancers most of the Undying sunk beneath the waters by the Cataclysm would eventually collapse without the necessary maintenance of the dark magic that drove their evil existances. To the west the small continent of Iandras was fractured into numerous islands, the island nation of Aruthol was left with a small fraction of it's former size after over 90% of it was submerged, and most notably the Gersage land bridge was flooded, creating the Gulf of Tears and the Straits of Upinthia, expanding the Sea of Osloanda by half again it's size and drowning the northeastern stretch of Zha'irian cities in the process. In the wake of this, Danoshorvas and Ullushorvas became seperate continents. Further, many parts of the world along the equator became much hotter for no reason understood by mortals, including the northern expanse of Ullushorvas, and the nations of Ullu'shu'ra and the Zha'irian Union lost the northern half of their lands outright. Ullu'shu'ra was able to continue to exist in a diminished state but Zha'ir collapsed, fracturing into smaller nations. The survivors of the Machtig were pushed by strong currents to the west for many months, along the equator and eventually through the new waterway of the Straits of Upinthia, and directly up through the Sea of Osloanda to land upon the beaches of what the Machtig came to call the Vold, near the beleaguered capital city of the Undari. This capital, called Borshioc, was located on the delta where the Unter-Calish River gives way to the Sea of Osloanda and had suffered extreme flooding and a loss of some portions of the lower city during the Cataclysm. The Machtig soon encountered the Kor, a fallen subrace of Var that claimed portions of the Vold as their own, as well as the Undari in the form of a slaving force come into the Vold to capture Kor to use as laborers in the repairing of their flooded capital city. The slaving party encountered a band of Machtig exploring their new land for suitable settlements and took them as slaves as well. When knowledge of this came to the leadership of the Machtig-Baelvolkerung, scouts were sent to discover more about this new enemy. The scouts returned with horrid tales of the Undari death cult and their systematic human sacrifices, but didnt realize that Borshioc was the capital of a vast Empire, or that if given time the Undari could marshal forces from far and wide to wipe out the remnants of the Machtig. Fearing that they had left behind the Morgathi only to find yet another enemy steeped in death magics, the leaders of the Machtig decided that their best hope lay in a single devastating assault upon this city of death, leaving no survivors. And so it was done. One fine midsummer day a force of 8,000 plus Machtig warriors, the last males of their people, a few hundred Druids, and a handful of Obermancers assaulted Borshioc, the capital of one of the largest Empires the world had seen in several Ages. Easily entering the partially destroyed city where its defensive works had been claimed by the Cataclysm, the Machtig poured in to the suprised metropolis. The Druids outnumbered the Thanomancers in the temple 3 to 1 and were able to prevent them from working most of their evil magics outright. Deprived of their weapon of terror, the Thanomancers were helpless before the savage barbarians. The Macthtig overwhelmed the High Temple of Undar, killing every Thanomancer and wiping out members of their feared personal guard as necessary. Though they took some losses, the Machtig were easily victorious. The Undu had ruled for several millennia on the basis of fear and the belief that their dark magics were undefeatable. With the shattering of this myth, a waving of angry uprisings by the oppressed peasantry of the vast Undari Empire, and thus it too fell like all the other great powers of the Age of Expansion. The Machtig-Baelvolkerung, the people who had inadvertantly caused the collapse of the previous Age, took control of the subcontinent they call the Vold over the course of a couple of decades by pushing the vast majority of the native Kor and smaller groups of other creatures out onto the plains to the north and west. Most of the fleeing Kor crossed the western lands of what had been Undari and took shelter in the Dregga Mountains, but after their Machtig pusuers returned to the Vold many flowed back down into the lowlands and took parts of what had been Undar for their own. Other tribes slowly pushed down into the Blasted Lands created by the Witchlords of Vorgaa's demise, claiming them as their own. Two thousand years later the Kor tribes still yearn to retake the Vold, which they call Cysgodion (kiz-gohd-EE-on) and consider to be their true homeland. There have been numerous attempts to reclaim the Vold in the succeeding two millennia, and countless border raids as well. In the early days of the wars to conquer the Vold the warriors of the Machtig pushed out from Hafenstadt, spreading out in all directions across the lowlands and eventually into the hills and highlands of the Wundvold Mountains. As ever more of the inland region was taken, some Machtig settled the lands and began to farm it. Eventually these people would become the Huarthmunn Clan. As the war for the Vold moved into the unforgiving peaks of the Wundvolding, where the Varic Kor were at their strongest, progress was slowed but not halted. Some of the most legendary and momentous battles in the history of the Machtig were fought during this time. When it was over most of the Kor had been forced onto the plains of the Undu to the north and west of the mountains. Some Macthig pursued them onto the plains, and drove them far away before returning. Meanwhile the rest of the Macthig continued to press the war to the east, following the arc of the mountains. Those that had pursued the Kor onto the plains returned to the mountains and rejoined with those warriors that had remained in place to prevent reentry by the Kor or other Ungheuer(the Machtig term for non-human enemies) settled in the cold and inhospitable western arc of the mountains and became the Wundvolding Clan over time. The other Machtig warriors split into two groups; one pressed the war to the eastern arc of the mountains and the other descending into the vast and dark Voldwald forest, which was home to many small groups of Ungheuer. These grim warriors waging war in the dark bows of the primordial forest were sorely tested but with the aid of their courage and the magics of the Druids and a few Obermancers eventually gained the upper hand. The Druids prevented total annihilation of the indiginous Ungheuer, however. Their part in the war for the Vold done, these valiant warriors settled into their new home and became the loose, spread out Jagrling Clan. The Machtig continuing the war in the mountains finally pushed through to the eastern end of the Wundvold, to the area near Borshioc from which the Machtig had fought their first battle in the Vold when they broke the Undari capital. Most of these people, the most aggressive and battle-hugry warriors of all the Machtig, settled in their vast new highland country and eventually became the Herodi. However some of these hardend warriors missed the sea, and returned to the coasts where Hafenstadt was still the seat of Machtig culture. Some settled the coastline, while others took up residence in Hafenstadt itself. Many returned to the longboats which had carried the Machtig to the shores of the Vold and began exploring; eventually they would take up raiding and become the Raevoring Clan. While the warriors pressed their war to secure the Vold, most of the scholars, tradesmen, and craftsfolk had remained behind in and around Hafenstadt. With the return of the aggressive and domineering warriors several decades later many of the residents found Hafenstadt intolerably testosterone ridden; many chose to sail up the Unien river and settled around Lake Pargo, which had bountiful forests around its northern edge and plentiful fishing. They eventually became the Pargori Clan. Meanwhile some of the warriors in the group that would become the Herodi took to catching and taming the wild mustangs which congregated between Lake Pargo and the highland hills, and formed a subculture based around the taming and training of such. They would eventually become the Hengsting. The northern reaches of the Voldwald were home to several packs of Wyrdynion, a near-human people made long ago by the Haelfinan in their interminable war against the combined armies of the Var and Humans in the Ages of Legend. Made specifically as a weapon against Humans, the Wyrdynion are shapechangers that can alter their forms between the semblance of a human, a wolf, and a fearsome hybrid of both. They can infect other humans with their bite, turning them into one of them, and have an instinctual urge to do so crafted into them by the Haelfinan. Ultimately the Wyrdynion turned on the Haelfinan as well, but are still dangerous to Humans. Some of the Jagrling residing in this region became infected with the Wyr curse, and soon the curse had spread to many other families and settlements. Terrible night time raids by Ulth-feren (wolf touched) Clansmen plagued the holds of all the Clans bordering the region, but particularly the more southerly Jagrling. Finally the Druids were able to provide a partial solution; they crafted a great magic that took away the ability of almost all the infected Machtig to infect others with the curse, and greatly diminshed the bloodlust that would consume them to attack other Humans as the moon waxed. However, the curse was still inheritable and thus the Ulthferen were born. Many wanted to slay the infected regardless, but the Druids counceled otherwise, saying that the turn of events that created the Ulthferen was foretold in prophesy and that they too had a part to play in the futures of the Mighty People. In the southernmost lands of those who were slowly crystalizing into the Jagrling Clan, a few steadings of Machtig made contact with an enclave of Haelfinan that had managed to survive on the mainland for many thousands of years. The Machtig's oldest legends spoke of such people, which they know as the Aelfing. Over long centuries these steadings interbred with the Haelfinan on occasion and were otherwise influenced by them, becoming the Faendradi Clan. Over the course of the last two millennia the warlike Herodi controlled the Machtig more often than not, and periodically led Machtig hordes in all directions to do war and pillage, as well as repulsing occasional invasions and attempted punitive measures from other nations. In the early days as the Clans formed conflict among the Clans would occassionally occur, though there was never outright war. This was almost invariably a Herodi affair, where they would uses the threat of force and raids to bully dissenting Clans and maintain their effective hegemony. The Druids and Skalds always put a stop to the intra-Clan conflict as fast as they could manage, but finally a little over twelve hundred years ago the Grand Druid Uliean declared that there would be an Oberlaird with authority over all of the Clan Lairds, and it would be every Machtig's solemn duty to do honor to the Oberlaird and to heed their edicts. The Oberlaird would be voted for by the Lairds from one of their own number, and would serve as Oberlaird so long as they were Lairds of their own Clan. No one may challenge the Oberlaird directly save a person pressing to become the Laird of that Clan themselves. The Oberlaird cannot interfere with the rule of other Lairds within their own Clanhold, but can set policies for the Machtig as a people, and can prevent individual Clans from waging wars of their own. Most importantly, any affair or altercation involving more than two Clans must come before the Oberlaird for judgement, and only the Oberlaird can call the Clans to war. The Oberlaird could also muster the forces of the Clans to punish an offending Clan, though it has never been necessary.. Since this time inter-Clan aggression has ceased, and though political wrangling is not uncommon between Lairds it is not resolved via violence. Of course, the Herodi have had more Oberlairds than all the other Clans combined, but on the other hand most Heroid Lairds tend to have relatively short tenures. The last nine decades have seen a string of long-tenured Pargori Oberlairds who have checked the warmongering of the Herodi and ushered in an era of unmatched peace and prosperity, opening trade ties with several key nations, and generally attempting to civilize the Machtig. Trade with Worfinal and Shidaal have been particularly key for the Pargori reign, and the current Oberlaird has been making great progress on cementing an actual formal alliance with the neighboring city-state of Shidaal. The more warlike Clans, most particularly the Herodi, Ulthferen, and Raevoring, are very disatisfied with the current state of affairs. The more martial and hardbitten fear that the nearly century of relative peace has made the Machtig soft and weak, and view the rising power of non warrior merchants and landowners with trepidation. Many feel that the very Machtig way of life is in jeopardy. However, a Druidic prophesy made upon the ascension of the Pargori almost a century ago indicated that a time of peace was called for, but that a time of war and a great testing of the Clans would follow it a centure hence. Many heed this and a powerful alliance is manuevering politically to make sure that the charismatic and popular Herodi Laird becomes the next Oberlaird. The Vold is a vast land, and though large parts of it are sparsely settled there is still a large population of Machtig residing therein. The above chart gives rough approximations of the sizes of the Great Clans in the modern day. As indicated some Great Clans are substantially larger than others. The Raevoring and Herodi Clans have more population than their lands (in the case of the Raevoring) or infrastructure (in the case of the Herodi) can truly support; however they are both warrior cultures and rely on large numbers of their warriors raiding abroad for much of the year to varying degrees. 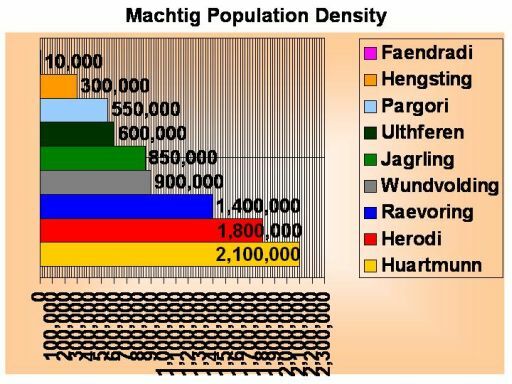 Similarly the Pargori population is higher than their Clanhold can support internally, but a higher than average urban population density, the disproportionately high influx of trade, a minor tendency of Machtig that fit poorly in their own Clans to abandon their own Clan and join the Pargori, and the tradition of a sizable portion of the population surviving as traveling merchants living abroad for extended periods balances things out. The Faendradi population is actually far below what their lands could conceivably support. The Clan has been slowly dwindling in size for many centuries for a variety of factors including the decreased fecundity of the Aelfing-bludded. The other five Clans have a population basically in line with what their Clanhold and infrastructure can support, though populations are somewhat higher in general thanks to the last nine decades of relative peace. NOTE: Slaves are not counted into these numbers, but Thralls are. Each Clan manages it's own relationships with outsiders in theory, but in general there are some common views of other peoples shared across the Clans. The Machtig like and respect the Var as a rule, and always do them great honor when they visit their steadings. There are two Varholds within the expansed of the Vold and a very large Varhold adjacent to the Wundvolding lands, and the Machtig have always had a friendly and mutually beneficial relationship with them all. The Wundvolding in particular are fond of the Var, and have been heavily influenced by Varic culture. The Machtig have a generally antagonistic relationship with the Kor, having driven them from the Vold two millennia past. There have been numerous wars, skirmishes, and pitched battles between the Kor and the Machtig in the long centuries hence. A single tribe of Kor, the Kor-Daen, still resides in the Vold due to the Druids staunchly refusing to allow the Machtig to wipe them out. They are generally smart enough to keep a low profile, but occasionally they cause trouble and bloodshed occurs. The Machtig call the Haelfinan the "Aelfing". The Machtig have had a strange relationship with them stretching back into eternity; Druids, the Faendradi, and some Zauberer (Aeldenari) in particular have a special connection with the Aelfing inhabitants of the Vold, and many of the Machtigs oldest lore contains stories of one such gaining some favor or blessing from the Aelfing. There are also stories of the dark side of the Aelfing; their strange bargains, inscrutable behavior, and mercurial passions. Amongst the highland and forest clans, the Aelfing are viewed in different ways; the Faendradi often intermarry and interbreed with the Aelfing, and there are some half-Aelfing born among them every year. The Ulthferen are generally antagonistic towards the Aelfing as the wyrdynion and the Haelfinan have long been enemies. The Jagrling generally have a live-and-let-live mentality. The lowland Machtig of the Huarthmunn and Pargori generally fear the distant Aelfing, and scare their children with night stories of ancient Aelfing curses and Der Wutend Jagr (the wild hunt). To the Herodi they are just another kind of Ungheuer, though decidedly more dangerous than most. Finally, the coastal Raevoring generally discount them as figments. Durogaun (DER-oh-GONE) is what the Machtig call the Dyrgynion. They are large humanoids that look like other men save that they are all at least ten feet tall or more. Generally peaceful they favor bluff highlands, and there are scattered villages of them in the lands of the Herodi,Wundvolding, and the more rugged parts of the Ulthferen lands. They are very rare and almost never seen, for despite their size they are adept at avoiding notice. Legend has it that they were once Machtig that were cursed by the Aelfing, but the Druids have remained silent on the matter. Whatever the truth, they are accepted and protected by the Druids, who have always taken a special interest in them and have been instrumental in their general acceptance by the Herodi, Ulthferen, and Wundvolding Clans. This community of Durogaun share the Machtig religion and some among them have even been initiated in the Druidic rites, though they are outside the normal bounds of Machtig society and are considered myths among most heartlanders and Raevoring. All the scattered Durogaun settlements recognize a single chieftan who is currently a crafty and brave warrior named Unthien Uroldssun the Fair. Unthien secretly wishes to see the Faendradi die out and have his people rise to take their place as the ninth Clan, though he dares not take action to ensure it. Occasionally packs of Affelaunes wander into Herodi lands. In general the Herodi leave them alone as they are hardly viewed as worthy opponents, but if the small people make nuisances of themselves the Herodi stomp on them until they are dead or gone. Hurgur (HER-GUR) are big thuggish humanoids, largely hairless, that live among the the mountains in both the Wundvolding and Herodi lands and occassionally stray down into the highlands to raid for food. They are tough and fierce combatants, and can be rapacious raiders even in small numbers. Most Hurgur are not terribly bright, though they often have a low cunning that makes them dangerous. It is considered to be a great feat for a Thegn to slay one single handedly among the Herodi and small bands of young Thegns can be found hunting them out on occasion. For their part the Hurgur of the Herodi lands respect and fear their oppressors, but also resent them. They would probably have been long hunted to extinction in those lands by the warmongering Herodi, but the Druids have prevented them from being wiped out entirely. The Wundvolding on the otherhand generally leave them be unless they threaten Humans, and some Wundvolding communites are on friendly terms with some Hurgur communities. There are some among the Hurgur of the Vold that have been influenced by generations of Druidic interference that believe that the Hurgur should make peace with the Machtig and ally with them; so far they are in the minority. There are clutches of Grol in the high mountains of the Wundvolding Clanhold, but in the Herodi lands hunting expiditions set out whenever a Grol incursion is sighted. The Wundvolding are content to only go after the clutches that are a hazard to their communities and trade, leaving the rest be. Wolfwaren is the Machtig name for Wyrdynion. Originally there was a sizable collection of packs in the Voldwald, but they were almost completely assimilated into the Ulthferen Clan long ago. There are a few small packs left wandering around, but they will be unable to sustain themselves for too many more generations. In the Vold some small pockets of Vorshek can be found throughout the moutain and highland areas, even in the Herodi lands thanks to their tenacious survivability. Dangerous when forced to fight, they are generally peaceful despite their fearsome appearance. However on occasion one will go rogue and begin to attack Humans, at which time the Huscarl of whatever Clan the Vorshek is active in is dispatched to kill the rogue. Also, the Kor-Daen tribe of Kor that still resides in small enclaves throughout the Wunvolding mountains like to take Vorshek and train them for battle, and use them as weapons. This is hard to do but extrememly effective when successful. Regardless, Vorshek are insanely difficult to kill, are grossly strong, and many warriors have fallen to their might. It is a mark of great honor to defeat a Vorshek even as part of a group, and to do so singlehandedly is the sort of thing warrior legends are based on. The nations to the north and east of the Vold are all fragments of the great Undari Empire that was effectively sundered by the Machtig. Historically Herodi led campaigns have run roughshod over the Undari nations at will, with even partial successes for the Undari rare. In general the Machtig (and in particular the Herodi) hold the Undari in total contempt as a people, though some have developed respect for individual Undari. In general the Machtig view the Vorgaanese they have had contact with as basically worthy adversaries, but believe they rely too much on magic. Some capable Vorgaanese warriors have made an account of themselves in battles past to earn a grudging respect, though the average Vorgaanese commoner is afforded no measure.